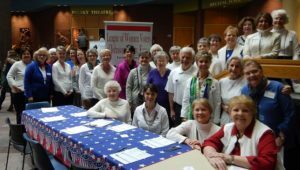 As we march toward 2020 and LWV’s 100th anniversary, volunteers continue to give their time and energy to ensure that League has a great future. When you join with smart, dedicated, and effective League volunteers, your contribution is multiplied because you are joining a nationwide network. Volunteer today and power our impact! LWV is a nonpartisan political organization. Our work encourages informed and active participation in government, increases understanding of major public policy issues, and influences public policy through education and advocacy. 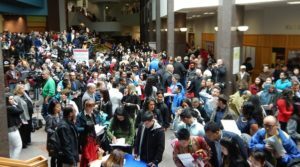 The Naturalization Committee staffs a voter registration table at monthly naturalization ceremonies for new citizens. The ceremonies are usually held at the Federal Building, 500 State Avenue, Kansas City, Kan. (Entrance on Nebraska Ave.) Two ceremonies are held at Johnson County Community College (JCCC) and in September the ceremony is held outdoors at the Fort Scott National Historic Site. The ceremony is generally held on the last Friday of the month at 10:30 a.m. Remaining dates for 2019 are: March 20 (JCCC), April 26, May 29 (JCCC), June 21,July 26, August 23, September 27 (Fort Scott), October 25, November 15 and December 13. Find out more about this committee. The Natural Resource Committee meets on the fourth Sunday of the month at 1:30 p.m. at the Central Resource Library. Please contact us for more information or to discuss joining this committee. Check out the many ways you can help protect our environment—from who you elect to serve on local governing boards to what you plant in your backyard. An observer regularly attends governmental meetings as the eyes and ears of League. Wearing your League pin, you act as a visible representative of LWVJoCo. Observers remain neutral on all issues and refrain from public comment. You take brief notes of the major actions taken at the meeting and share the high points in the monthly newsletter The VOTER. Currently, LWVJoCo observers cover the following county boards (Board of County Commissioners, JCCC Board of Trustees, Johnson County Mental Health Board, Johnson County Library Board, Johnson County Parks and Recreation, Johnson County Committee on Aging, and Unified Government of Wyandotte County and KCK); school boards (Blue Valley and Olathe); and city councils (Leawood, Lenexa, Overland Park, and Prairie Village). Being an observer is a great way to learn about local government and to share that information with League members. Can’t commit to every meeting? Sign up with a friend and share the responsibility. Need a speaker for your next meeting, workshop or event? As many groups plan their events calendar, we want to make sure you’re aware that LWVJoCo offers interesting and nonpartisan presentations to community groups and gatherings on a wide range of timely topics. We can adapt our presentations to meet your group’s needs, from a short 20-minute overview to a longer presentation and discussion. No fees are required for our knowledgeable volunteer speakers to present a program to your group. We currently offer these topics. Is fracking a risk to Johnson County? To learn more about these presentations and how to schedule one for your organization, ContactUs@lwvjoco.org. Our volunteers staff voter registration tables at high schools, colleges, retirement homes, civic events, businesses, and food pantries. The League encourages voters who have moved since the last election to update their voter registration with their new address. If you have an interest in lending a hand with some of these and other communications-related projects, please contact us. League of Women Voters urges support of the For the People Act in the Senate. This legislation will will modernize our election system, reform redistricting, and restore the Voting Rights Act. The time to fix our democracy is now! Contact Senators Roberts and Moran.today!. League of Women Voters is proud to sign an amicus brief in opposing a new, untested and unnecessary citizenship question on the 2020 census. Along with 178 groups, we urge the Supreme Court to strike this citizenship question. Learn more about our brief and sign the petition. Congress: MegaVote: Sign up to receive a weekly update. Track recent congressional votes (Sens. Roberts and Moran and Rep. Davids). Read the full issue of the April 2019 newsletter. View past issues of our newsletter.